Modern design, maximum functionality! The GROHE Zedra comfort kitchen tap pleases the eye and at the same time lacks nothing in terms of convenience: design features like its fluid forms, lever shape and funnel-shaped spout lend a very elegant look to this tap. With well-thought-out features like its high swivel spout, the easy installation system and the pull-down comfort spray head, it is a popular helper in the kitchen. The tap is made of non-rusting, scratch resistant stainless steel, which is particularly hygienic and at the same time easy to clean thanks to its smooth surface. 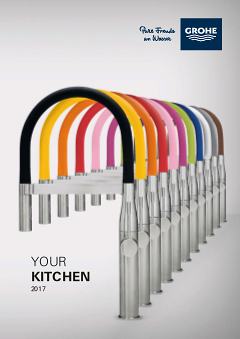 An attractive, smart and top quality product for your kitchen, through and through!